We were formed for God’s family. And so do not be surprised that when we follow the ‘makers instructions’ and keep to the recommended weekly service intervals we remain covered by the manufacturers warranty. Jesus said “The thief only comes to kill, steal and destroy but I have come that you may have life abundantly.” (John 10:10). He meant it because it is true. Satan is in the demolition business of wrecking lives. Jesus is in the construction business, rebuilding, remaking broken lives. It is an eternal principle that we will live longer and enjoy a higher quality of life if we obey the ‘makers instructions’ and keep to the recommended weekly service intervals. You were formed for God’s family. And Ephesians 2 explains why this is so. Paul uses three very important words to summarise life before and after coming to know Jesus Christ. Separation, Reconciliation, and Unification. Paul starts by reminding them of what they were before they came to know Jesus. He dwells on their spiritual poverty. This is how the Bible describes those outside the Church. No wonder stress levels, drug abuse, alcoholism, divorce, suicide, and mortality rates are higher and life expectancy is shorter outside the Church. My first experience in Holland last week was being asked if I wanted a McCrocket at MacDonalds. Now I know what goes into them, I wish I hadn’t… Remember what it feels like to be a stranger? An outsider? A foreigner? That is how the Bible describes people living in God’s world but without a personal relationship with Him, without a home in his family, without a knowledge of the makers instructions. That is why ones life expectancy is shorter, and quality of life lower. No wonder people think happiness and contentment will come with the bigger house, the higher salary, the latest car, the newer wife. Next time your friends say religion is just a crutch for the weak invite them to your fitness gym. Separation – what we once were. The “but now” of verse 13 parallels the “but God” in verse 4. Both speak of the gracious intervention of God on behalf of the lost sinner. God has taken the initiative in Jesus Christ. you will see that the problems really begin from chapter 10, when the first Gentiles – the family of Cornelius became Christians. There was a lot of heated debate over whether the Gentile Christians had to become Jews first. The Church leaders held a conference recorded in Acts 15 and agreed that it wasn’t necessary because in Christ God had broken down the historic barriers between Jews and Gentiles. There was no longer any difference. All accepted before God on the same basis. Grace not works. Faith in Jesus not racial pedigree. As the judge Jesus could have come to declare war but he didn’t. He came instead to accomplish peace, and it cost Him His life. our shame, our greed, our fears, our doubts. From now on nothing can separate us from the love of God. No wonder the experience of that love, that forgiveness, that peace has physical and psychological consequences in improved health and life expectancy. Unlike the Health Service, there is no waiting list for treatment. You don’t even have to go private and pay for your treatment. Jesus has paid the price. Peace with God is available 24 hours a day, 365 days a year. Claim it for yourself and share it with your friends. Separation – what we once were. Reconciliation – what we now are. Paul uses three pictures to illustrate the unity of the Church as it continues to grow inwardly knit together in harmony, upward toward heaven in holiness and outward around the world in witness. Its strange to watch Europe seek greater integration while all over the world smaller and smaller people groups are seeking autonomy and independence from one another, even fighting each other to achieve it. Our citizenship in God’s family is more important, more secure and permanent than any nationality on earth. We are one nation. You are called to belong, not just believe… We are created for community, fashioned for fellowship and formed for a family, and none of us can fulfil God’s purposes by ourselves. The Bible says we are put together, joined together, built together, members together, heirs together, fitted together, and held together and will be caught up together. You’re not on your own anymore… “While your relationship to Christ is personal, God never intends it to be private. In God’s family you are connected to every other believer, and we will belong to each other for eternity... Following Christ involves belonging and not just believing. One nation, One family. The magnificent Temple in Jerusalem was destroyed by the Romans in 66 AD. The massive Temple to Diana at Ephesus looked equally impregnable, but it is no more. The temple of God, by contrast, has been growing upward and outward for 2000 years and growing larger every day – indeed its growing faster than the birth rate. How? Because Jesus is its cornerstone. The apostles and prophets its foundations. The Holy Spirit is its life and we its bricks and mortar. No wonder our life expectancy is improved. No wonder our quality of life is superior. God is working his purposes out in us and through us, building one nation, one family, one temple of God and for God. Neither spiritual death, nor physical distance can separate us from His love, nor defeat the power of His grace at work in and through us. 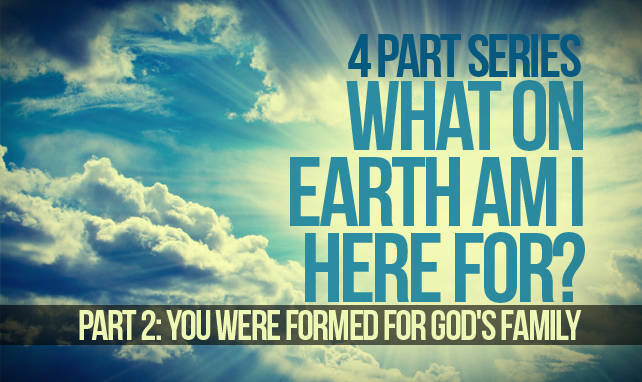 Lets draw out four principles about why we were formed for God’s family. But we do this when ever we think we can live in isolation, “whenever we dismiss or demean or complain about the church…” “The Bible says a Christian without a church home is like an organ without a body, a sheep without a flock, or a child without a family. It is an unnatural state, an unhealthy condition. “The local church is the classroom for learning how to get along in God’s family. Only in regular contact with ordinary, imperfect believers, can we learn real fellowship.” We need more than the Bible in order to grow; we need one another. A church family moves you out of self-centred isolation. As we have seen, the bible insists that, “the church is a body, not a building, an organism not an organisation… For the organs of your body to fulfill their purpose, they must be connected to your body. The same is true for you as a part of Christ’s Body. You were created for a specific role, but you will miss it if you are not attached to a living, local church. You discover your role in life through your relationships with others. If an organ is somehow severed from its body, it will shrivel and die. It cannot exist on its own, and neither can you. Disconnected and cut off from the lifeblood of a local church, your spiritual life will wither. This is why the first symptom of spiritual decline is usually inconsistent attendance at Sunday services and other gatherings. When we become careless about fellowship, everything else begins to slide too.” “Biblical fellowship is being as committed to each other as we are to Jesus Christ.” Most Christians can recite John 3:16. How about memorizing 1 John 3:16, “Jesus Christ laid down his life for us. And we ought to lay down our lives for our brothers.” (1 John 3:16). The Bible says that you can’t claim to be a follower of Christ if you are not participating in a church. So your membership in a church family identifies you as a Christ follower. That is why our memory verse for this week is Romans 12:5. A church family enables us to reach the world for Christ. “As members of Christ’s body, we are His hands, His feet, His eyes, and His heart. The Church filled and empowered by the Holy Spirit is the principle means by which God is made visible in the world today. The quality of our relationships will determine the effectiveness of our witness. For what we do either confirms or undermines what we say. “We are created for community, fashioned for fellowship, and formed for a family, and none of us can fulfill God’s purposes by ourselves. The Bible says we are put together, joined together, built together, members together; heirs together, fitted together, and held together and one day – will be caught up together. You’re not on your own anymore.” So, while your relationship to Christ is personal, God never intends it to be private. In God’s family you are connected to every other believer, and we will belong to each other for eternity. We were formed for God’s family, and appropriately today, we invite you to express that by signing our new membership covenant. In your CC-News you will find a copy. Please take it out. Easter is traditionally the time when we are challenged to respond to all that Jesus has accomplished for us in his death and resurrection. It is often the time when people were baptised and confirmed. Every year at this time we have in the past invited people who have joined the church family during the previous year to join our electoral roll by signing the electoral roll form. And we would invite you to do this as it is one of the means by which the Church of England determines whether we can have clergy and calculates our financial contribution to the Diocese. It is a nominal expression and you don’t even need to regard yourself as a Christ-follower to join the ER. If you have not yet done so, please do. This Easter, for the first time ever, we want to go much further. During January and February we taught morning and evening, a sermon series on what it means to be a member of Christ’s church. We are now inviting everyone who considers themselves a member of Christ Church to put their name to a simple declaration to covenant, with God’s help, to work together to fulfil our vision. We believe this is how we can best grow together as followers of Christ. The Apostle Paul mentions two different types of commitment in 2 Corinthians 8:5: “First they gave themselves to the Lord; and then, by God’s will, they gave themselves to us as well.” (2 Corinthians 8:5) You commit yourself to Christ for salvation and then you commit yourself to other Christians for membership in a local church family. The word fellowship (koinonia) means being as committed to each other as we are to Jesus Christ. We live as New Testament, or New Covenant believers, and so we will be inviting you to express it annually at Easter time each year. If you identify with Jesus Christ and his church family here, and can affirm these promises, I would ask you to sign the covenant and place it in the collection as you leave, or the box in reception. If you want to think and pray about it some more, please sign it and return it next week in the same way. It is not by accident that you are here today. God created the church to meet your five deepest needs; a purpose to live for, people to live with, principles to live by, a profession to live out, and power to live on. There is no other place on earth where you can find all five of these benefits in one place. God’s purposes for His church are identical to His five purposes for you. Worship helps you focus on God, fellowship helps you face life’s problems, discipleship helps fortify your faith; ministry helps find your talents; evangelism helps fulfill your mission. There is nothing else on earth like the Church! This is why it is so important to be a member of a local church family. It proves you are committed to your spiritual brothers and sisters in reality, not just in theory. God wants you to love real people, not ideal people. “so in Christ we who are many form one body, and each member belongs to all the others.” (Romans 12:5). Let is express our commitment to God and to his body in this community through this covenant. The benefits of sharing life together in this way far outweighs the costs and in the end, prepares us for heaven and eternity together. Lets pray. This entry was posted in Sermons, Theology on March 1, 2015 by Stephen Sizer.